WASHINGTON — A federal judge has ruled that Education Secretary Betsy DeVos illegally delayed an Obama-era rule that required states to address racial disparities in special education programs. In a decision on Thursday, Judge Tanya S. Chutkan of the United States District Court for the District of Columbia called the Education Department’s delay of the special education rule “arbitrary and capricious.” The rule, drafted under the Individuals With Disabilities Education Act, would require states to identify districts with “significant disproportionality” in the number of minority students channeled into special education services, segregated in restrictive classroom settings or disciplined. The rule, passed in the final weeks of the Obama administration, required districts to examine policies and practices that contributed to the disparities and fund remedies. Civil rights groups hailed the ruling as a victory over one of the most significant policy moves that Ms. DeVos has made to date. While the department has rescinded nonbinding guidance documents, which championed Obama-era practices for addressing racial bias, the special education rule is binding, and states had been preparing to enforce it for more than a year. Denise Marshall, executive director for the Council of Parent Attorneys and Advocates, an advocacy organization that sued the department over the delay last year, said the decision, “assures states will be required to help their districts who have historically discriminated against children,” by offering them services rather than suspensions. “The court has sided with the children whom the department had deemed unimportant through its actions,” Ms. Marshall said. Liz Hill, a spokeswoman for the Education Department, said that the agency was reviewing the ruling and exploring its options. 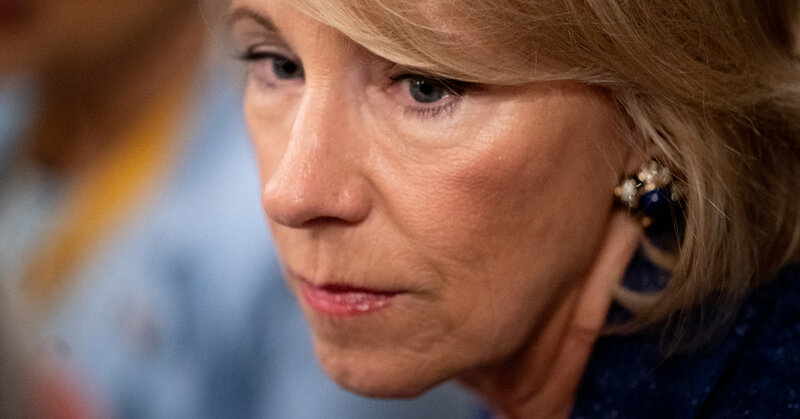 Ms. DeVos delayed the rule after a public comment period in which the overwhelming majority of more than 300 commenters expressed concern that discriminatory practices were denying black and Hispanic students a proper education in a traditional classroom setting, and pushing them out of school to lives on the margins of society or in prison. The department largely sided with the rule’s opponents who believed that large disparities were not evidence enough of discrimination in classrooms, and could be a result of other factors such as districts’ capacity to train teachers in properly identifying and disciplining students with disabilities. It also argued that the rule could have unintended consequences for those same children if districts felt pressure to meet “racial quotas” to avoid being found in violation of the rule. “The secretary is concerned that the regulations will create an environment where children in need of special education and related services do not receive those services because of the color of their skin,” the department wrote. But Judge Chutkan wrote in her ruling that the department’s concern over racial quotas “did not have adequate support in the rule-making record.” She wrote that the department failed to show how the safeguards in the Obama-era rule, which expressly prohibited racial quotas, were insufficient. “By forcing the Trump administration to implement the rule, the court’s ruling will put us back on a track toward reversing systemic racial discrimination in education,” Mr. Scott said in a statement. But district leaders might not welcome the news. Among those who supported Ms. DeVos’s delay of the rule was the School Superintendents Association, which represents more than 13,000 superintendents across the country. Under the Obama-era rule, states must apply a standardized methodology, and establish a formula called a “risk ratio,” to identify districts with high levels of disparities. Those found to have wide disparities would be required to set aside 15 percent of their federal funding to examine their policies and take corrective measures. The association wrote in a public comment last year that the new formula stood to impose a significant financial burden on districts found to exceed thresholds, and could further strap already underfunded special education programs. The group wrote that this year, more than 300 districts would save money as a result of the delay. “Without considerable new financial and technical support from the states, a new requirement for hundreds of districts to address significant disproportionality will either not be fulfilled or will be met with lackluster results,” the School Superintendents Association said.